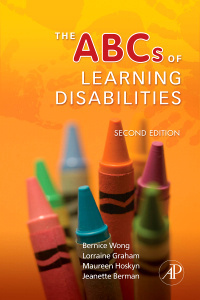 The ABCs of Learning Disabilities, Second Edition, discusses major research findings on learning disabilities in children, adolescents and adults in language, memory, social skills, self-regulation, reading, mathematics, and writing, with an additional chapter on assessment. This concise primer is intended for use as an undergraduate introductory text to the field. Written with an evenness of tone, breadth, and depth, the conveys an engaging style meant to encourage the beginning student to identify the “big picture and to be interested in conceptual issues as well as research findings. How Does Children's Language Develop? Psychology students studying learning disabilities and special education, as well as special educators, regular classroom teachers, school psychologists, speech pathologists, and other education and health care professionals. Bernice Wong is Professor Emeritus at Simon Fraser University, Burnaby, British Columbia. Prior to retirement, her passion had been writing intervention research with students with and without learning disabilities. In retirement, her love for writing has transformed from academic writing to short stories about interesting events in her life.